This morning, the major stock market indexes are coming under some heavy selling pressure. The decline in the major stock indexes looks to be very broad based. The one sector that is leading the decline this morning looks to be the large integrated energy stocks. 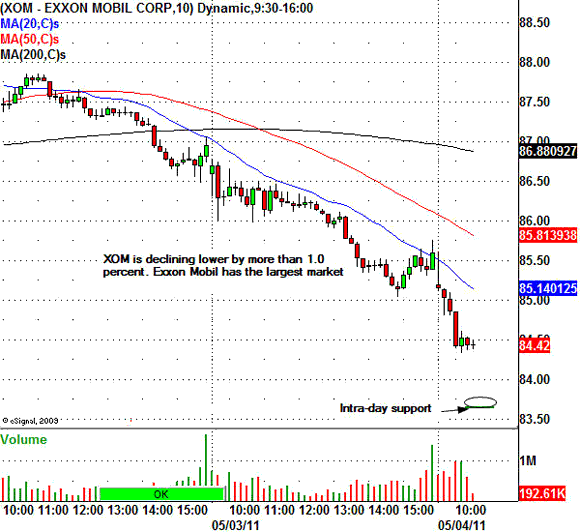 Stocks such as Exxon Mobil Corp. (NYSE:XOM), Chevron Corp. (NYSE:CVX), and ConocoPhillips (NYSE:COP) are all trading lower by more than 1.00 percent. Energy stocks account for 16.0 percent of the S&P 500 Index. Other leading energy stocks that are trading lower include Chesapeake Energy Corp. (NYSE:CHK), Devon Energy Corp. (NYSE:DVN), and Suncor Energy Inc. (NYSE:SU). Lately, when the U.S. Dollar Index has declined lower the energy stocks and most other commodity related stocks have bounced higher. That inverse relationship between stocks and the dollar has not occurred today. This tells us that the recent leading stocks could see further declines.